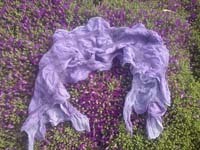 Address of Carla de Ruiter, wool artisan.. I'm Carla de Ruiter, Dutch by birth, living in Spain since 1989. Professional artisan and pedagogue. 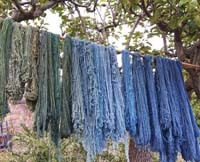 From small trapped by yarns and fabrics, always curious to learn more about natural fibers, especially wool and natural dyeing. This is part of my history and my inner experience. In my country, the shepherds and their flocks were part of my daily landscape in the woods and on the moorland. When I was little, I was used to take long walks and cycling routes around my village. It was common to see at sunset that sheep and shepherd returned to their typical barns. In one of these routes by bicycle with my mother we found in a sheep and shearing fair a man spinning wool with a spinning wheel. A few months later the same man (Jan Bark) who was of my village (more than 100,000 habitants), became my first teacher of spinning, weaving and natural dyeing (1980). Gradually there was simmering a story that, initially had no name but over the years and the activities that were imposed naturally, has become part of my act and my way of lifetime. Modest and meaningful. These activities, in the beginning only at weekends and sometimes very rare, facilitated me to be next to my children when they were small, and at the same time let me grow in my work as my children were growing up. You can contact with fibrart through this form or by email at fibrart@fibrart.eu.